Germany’s Chancellor Angela Merkel met with Turkish President Recep Tayyip Erdogan on Thursday and was rebuked by Erdogan for using the term “Islamist terrorism”. Erdogan said the phrase was not correct and saddened Muslims. After holding a critical bilateral meeting with Erdogan, Merkel spoke of the need for Turkey and Germany to cooperate even further to fight against terror, including “Islamist terrorism” and Kurdistan Workers Party (PKK) militants. “We spoke in detail about… the questions of the fight against Islamist terrorism, against every form of terrorism, also the terrorism of the PKK,” she said alongside Erdogan at his palace in Ankara. “We agree we want to cooperate, we are all affected by this. We agreed to have closer cooperation in the future,” she said. “This expression ‘Islamist terror’ seriously saddens us Muslims,” Erdogan replied, glancing sternly at the German chancellor. He said it would be “saddening” if the term was used because of the crimes of the so-called Islamic State (IS) extremist group, which has been blamed for a string of attacks in Turkey over the last year. “Please let’s not use it. As long as it is used we need to stand against it. As a Muslim president personally I cannot accept that,” he said. At the end of the discussion, Merkel did not use the term Islamic terrorism. 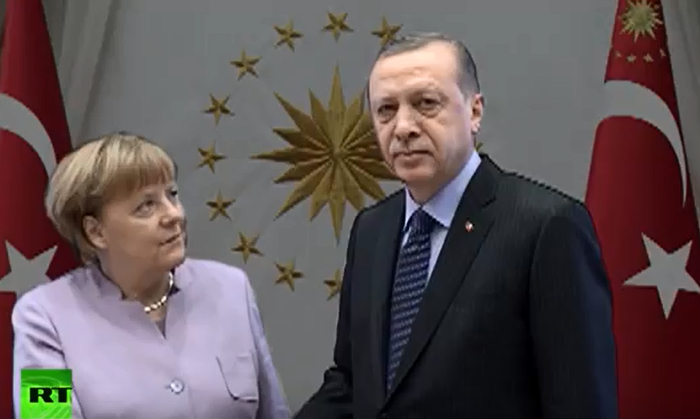 Chancellor Merkel tried to have eye contact at least five times with Erdogan and he would have none of it. It was clear that Muslim Erdogan looked down upon Merkel. Erdogan’s comments about Islam meaning ‘peace’ were not true. Islam means ‘submission’ and women in Islam are to submit to men. This may be why Erdogan looked disgusted talking to Merkel. According to Islam she is not his equal.